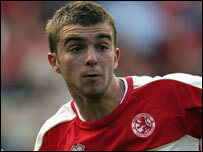 West Brom have completed the signing of Middlesbrough midfielder James Morrison in a £1.5m deal. The 21-year-old has signed a four-year contract after passing a medical at The Hawthorns on Tuesday. The fee could rise by a further £700,000 depending on appearances, while Boro will also receive 15% of any sell-on fee. He becomes Albion's second signing of the day after defender Carl Hoefkens joined from Stoke for £750,000. Morrison has made nearly 100 appearances for Boro since making his debut as a 17-year-old in January 2004, including a starting role in their Uefa Cup final defeat in 2006. He featured in 28 of Middlesbrough's Premiership games last season but almost half of those appearances came off the bench. West Brom boss Tony Mowbray said: "James is a very talented young player and we're delighted he's agreed to join us. "He's a creative midfield player and will bring versatility to our attacking options. "Despite the fact he's only 21, he already has more than 60 Premiership appearances under his belt and was a regular in the Boro side which reached the Uefa Cup final. "We're delighted he sees this as the place to progress his career and hopefully help us be successful."